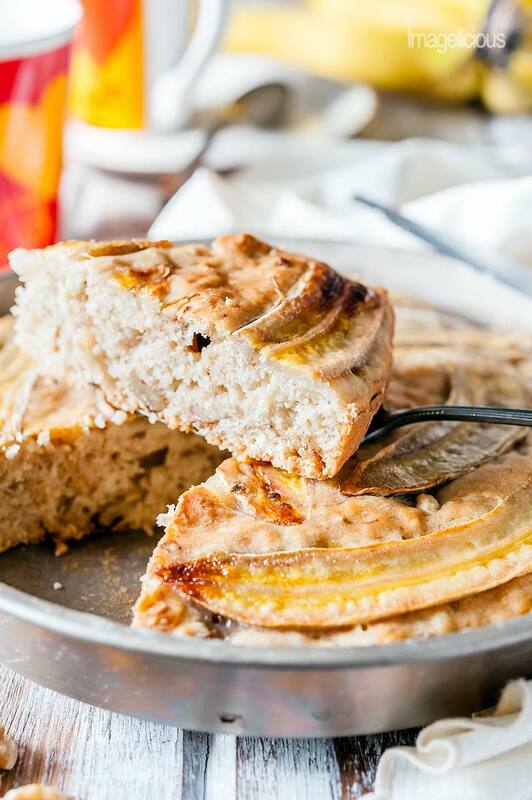 This Vegan Banana Cake (or Vegan Banana Bread) is the best banana cake you will ever have. You won’t miss butter or eggs in this recipe. 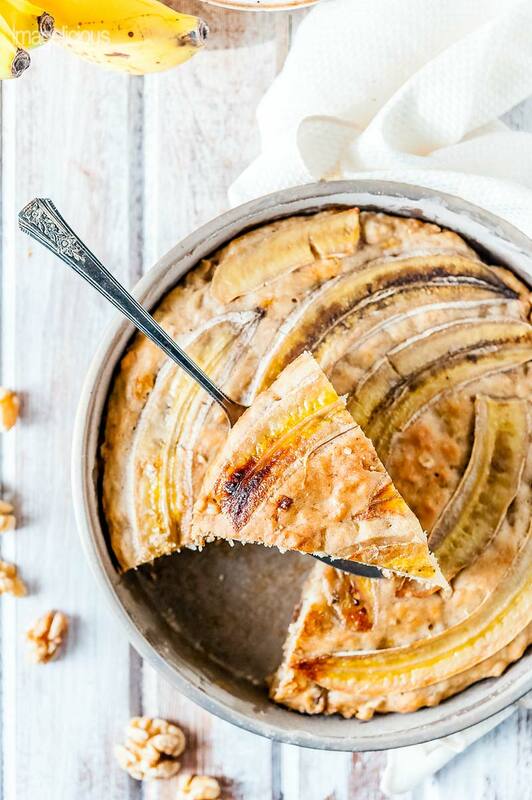 It’s soft and flavourful with delicious banana flavour and studded with walnuts. 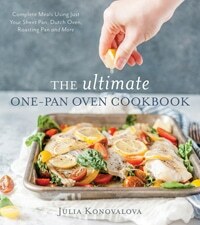 Whether you call it Banana Cake or Banana Bread, you won’t be able to stop at just one slice. This post contains amazon affiliate links which means that if you purchase something after following one of those links, I will get a small commission. 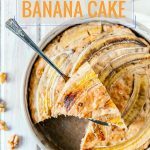 I love banana cake and I have a really good recipe for it. I used to make it all the time until one day I had no greek yogurt so I knew I had to adapt the recipe. And once the yogurt was removed I thought that I might as well remove the eggs. I came up with the recipe for this Vegan Banana Cake (or Vegan Banana Bread if you want to call it that) in February. Since then this is the only Banana Cake recipe I make and I’ve made it at least a dozen times (probably more). We eat a lot of Vegan Banana Cake around here. And baby also loves it. I don’t give her a lot of it, maybe an inch wide piece or so but she loves it and asks for more. 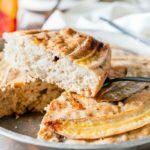 What I love about this Vegan Banana Bread recipe is that it’s super easy to make and you only need one bowl and one fork to mash the banana. You could technically switch to a spoon after but I often keep mixing everything with that fork so that there’s even less cleanup. The cake turns out moist and delicious with intense banana flavour, studded with crunchy walnuts. I made it with pecans also (my favourite nut) but walnuts just work better here. As with most my desserts I use a little bit of Orange Oil – it’s one of those ingredients that I think everyone must have. Not should, not maybe, but it’s a must! 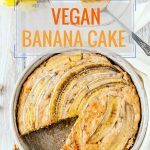 Can you make Vegan Banana Cake with just ONE banana? Yes, you can!! 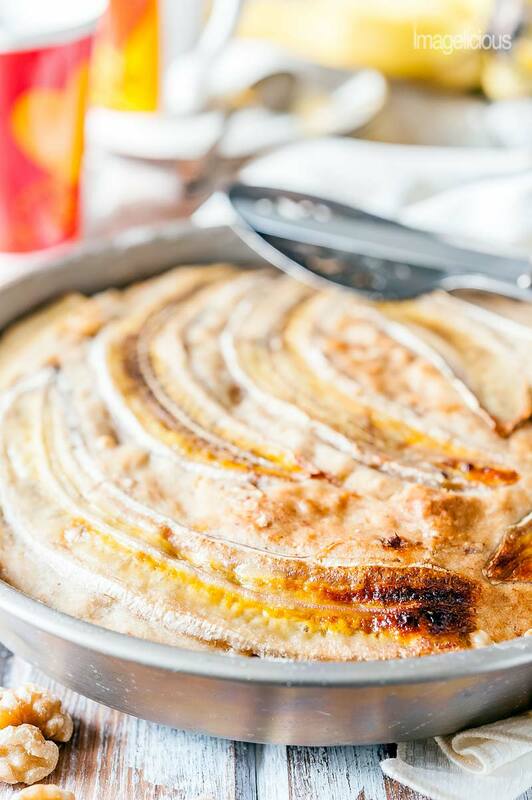 Another great thing about this recipe for Vegan Banana Cake is that it could be made with just one banana. You might need to add a bit more sugar to make it sweeter but I actually don’t do that. And it will also bake faster since there will be a bit less moisture in the cake. Well, enough talking about it. I just want to finish with this: it’s one of my absolutely favourite things to make and eat. It’s just plain good and delicious and easy and run to the kitchen and make it right now!! You should! It’s that good! Would you like to try a few more vegan cakes? Oil and flour 8-inch cake or pie plate. In a large bowl mash 2 bananas until very smooth. Add oil, water, vanilla, orange oil and mix well. Add flour and baking powder and mix just until flour disappears. If you are using another banana on top, then slice it lengthwise into 4-5 slices and place on top. Alternatively you could dice it into circles and cover the top with them. Bake for 1 hour and 15 minutes or until a toothpick inserted in the middle of the cake comes out clean. 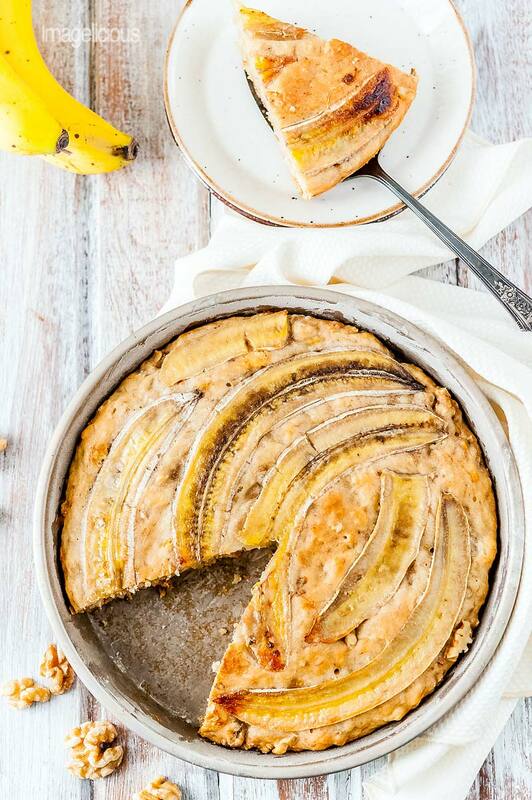 You could use just one banana for the base of the cake instead of two. If you use just one and you like sweeter desserts, then add another 1/8 cup of sugar. The cake might bake sooner so start checking after 55 minutes. I made this for a vegan friend I had over for brunch. I’m not gonna lie… I was skeptical. Turns out this is absolutely moist and delicious and full of banana flavor. Here’s a tip for those who can’t find or afford orange oil (it’s sort of expensive for a one off ingredient): use the zest of one orange instead. You get a bright lovely greasy orange flavor. 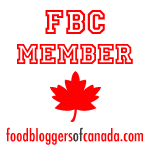 I am so glad you liked the recipe! Yes, orange oil is expensive but it’s honestly one of my most used baking ingredients and it lasts for a long time as you only need half a teaspoon or a teaspoon at a time, so that bottle usually lasts me about a year or even longer. But as you said, orange zest also works! Amazing vegan dessert cake. Just awesome.